The wide variety of hemiplegic sling designs, the lack of a uniform approach to sling selection, and the paucity of research data in this area have tended to make prescribing a sling a subjective process. Based on clinical experience and a comprehensive literature review, the authors propose a checklist for examining hemiplegic slings. The Checklist, which includes 19 desirable and 4 undesirable characteristics of slings, provides a more objective basis for comparing sling designs, warns of potential hazards, and facilitates the thorough examination of hemiplegic slings. The uses and limitations of the Checklist are discussed. How does the GivMohr Sling compare with the Checklist? Click here for the answer. 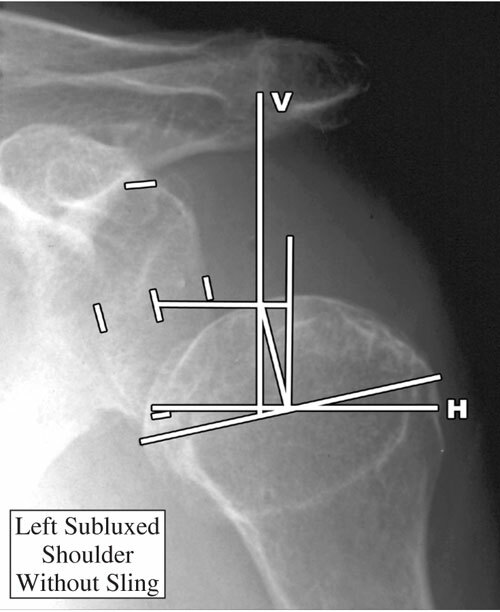 The purpose of the study was to compare the effectiveness of the GivMohr sling in reducing subluxation while providing joint compression through a flaccid limb, using the criterion standard of radiography for measuring subluxation. Twenty-five adult volunteers with a flaccid upper limb (UL) secondary to cerebrovascular accident or other pathology participated in the study, which was conducted by the University of New Mexico, Health Sciences Center, Physical Therapy Program. The results of the study revealed a significant main effect for vertical but not horizontal subluxation. 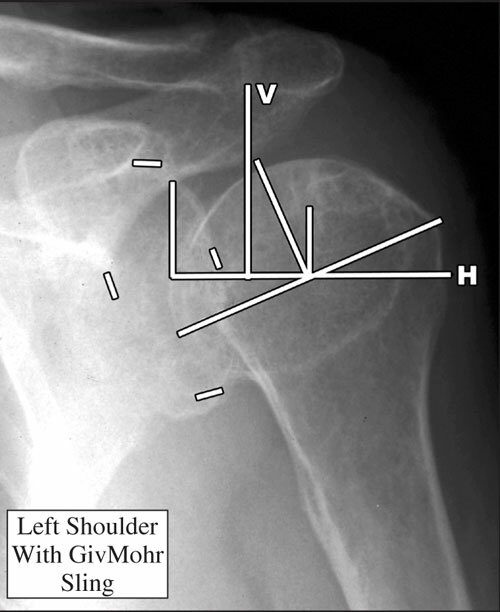 Post hoc tests showed that the GivMohr sling measures were similar to measures for the uninvolved shoulder. The study authors concluded that a properly fitted GivMohr sling reduces subluxation without overcorrecting and provides an alternative treatment option for persons with flaccid ULs that may prevent secondary complications and improve outcomes. For your convenience, you may view and print a summary of the study or read and print the full study article. Cerebral vascular accident (CVA) is a devastating event that brings with it a wide variety of impairments. The deficits arising from even a small CVA can affect every system in the body. Physically, the most noticeable system affected is the musculoskeletal system. Following CVA, the muscles of the involved side have the daunting task of functioning with an altered nervous system. Rehabilitation is often frustrating and functional returns may be minimal. Nowhere is this seen or felt more than in the upper extremity. 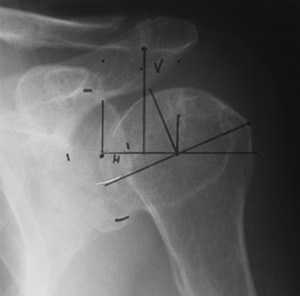 A flaccid or low tone upper extremity is a common finding in individuals following a CVA, and its rehabilitation is crucial in the recovery process. A flaccid upper extremity presents a challenge to the treating therapist because the protection necessary for the extremity involved often hinders its functional return. Upper extremity positioning and slings are often used to protect the upper extremity. There are several different ambulatory upper extremity supports used in stroke rehabilitation. All of these slings are designed to support the arm, but few actually reduce subluxation and none of them support the arm in a functional position. Therefore support of the hemiplegic limb while in the upright position remains controversial. It is hypothesized that early, proper support of the flaccid upper extremity leads to decreased subluxation, increased potential for motor return, and improved balance and upright mobility skills. With this in mind, the GIVMOHR SLING was created and developed by Vicky Givler, OTR/L and Paul Mohr, PT over a period of three years. This sling supports the upper extremity in a functional position, reduces shoulder subluxation and provides weight-bearing through the involved side to increase proprioception and normalize tone. This support provided by the GivMohr Sling allows for improved movement quality and increased function. The sling is to be used in upright activities including walking. Three small pilot case studies have been conducted with the GIVMOHR SLING at the University of New Mexico, Department of Physical Therapy under the supervision and direction of Assistant Professor Kathy Dieruf, PhD, PT, NCS. The second research project was done at the University of New Mexico, Physical Therapy Department by Erin Joerg, PT student and Kathy Dieruf, PhD. PT, NCS on the effects of the GIVMOHR on reducing both horizontal and vertical subluxation- GivMohr Radiographic Analysis. The study reviewed types of slings available and what were the ideal characteristics of slings to support the flaccid upper extremity. It was found that the "incidence of subluxation in CVA survivors varies from 12%-73%." 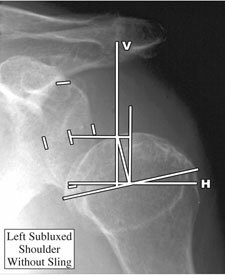 It was also emphasized that if shoulder subluxation was left untreated that complications such as distension of the capsule, stretching of surrounding musculature, limited mobility, shoulder hand syndrome, subacromial impingement, interference with functional activities, and impairing return of upper limb function. Use of slings may prevent these injuries. 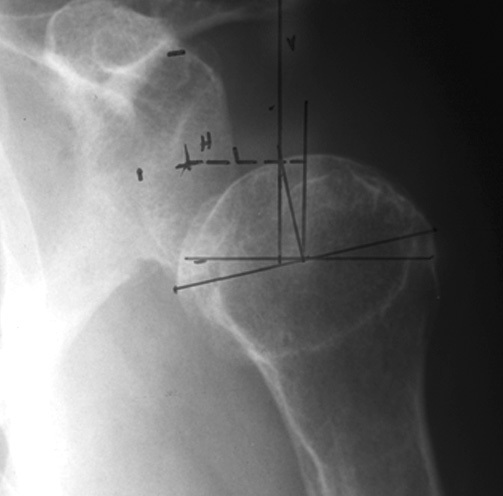 A study by Smith presents the "Checklist for Prescription of Slings" which includes proper positioning of the humeral head in the glenoid fossa, some humeral abduction, external rotation, elbow extension, neutral wrist, unobstructed hand function, abduction of fingers, encouragement of scapular depression and retraction. Comfort, cosmetic appeal, snug fit without skin break down and the capacity to permit active or passive ROM." Three anterior/posterior view radiographs were taken of three individuals with a flaccid upper extremity; without the GIVMOHR sling, with the GIVMOHR sling, and the uninvolved shoulder. The study found that the GIVMOHR sling reduced subluxation in addition to it other functions. The study concluded that the GIVMOHR sling meets the criteria on the "Checklist for Prescription of Slings". It also provides forearm support, and was successful in decreasing subluxation vertically and horizontally without overcorrecting. The sling is successful by the above criteria and promotes weight bearing in anatomical and functional positions. Dunbar, William, PT, and Kathy Dieruf, PhD, PT, NCS. The GivMohr and Gait. University of New Mexico, Physical Therapy Department, 1999. Joerg, Erin, PTS, and Kathy Dieruf, PhD, NCS. 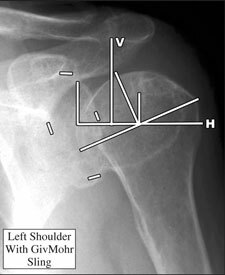 GivMohr Radiographic Analysis. University of New Mexico, Physical Therapy Department. 2000. Appel, Melissa, PT, and Kathy Dieruf, PhD, NCS. The Effects of the GivMohr Upper Extremity Weight Bearing Sling on Function Following Stroke. This study conducted at the University of New Mexico offers valuable information about how the GivMohr Sling can help to normalize gait and improve velocity. This study is not yet published, but was presented at the Physical Therapy Combined Sectionals, Chicago, March 2012. Please click here to read the presentation summary. Occupational therapists frequently use shoulder slings for the management of post-stroke shoulder subluxation despite the low evidence for its efficacy. One hundred and sixty-eight Occupational Therapists in California responded to a survey regarding the occurrences and clinical reasoning in the use of shoulder sling with patients post stroke. therapy practice across the clinical settings? 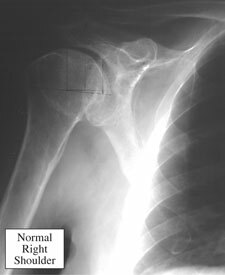 What is the clinical reasoning for using the shoulder sling? What types of sling are commonly used in the post-stroke occupational therapy practice? What is the clinical reasoning for the selection of the particular sling? Please click here to read the full study.